On the 15th of June 1919, a Sunday morning, Captain John Alcock and Lieutenant Arthur Whitten Brown landed their Vickers Atlantic Vimy in Connemara, close to the Marconi Transmitting Station on Derrigimlagh bog, a few miles beyond the town of Clifden. A plane had completed the very first non-stop flight of 1,900 miles across the vast emptiness of the Atlantic Ocean from Newfoundland to Ireland. In 2006 the poet Peter Fallon spent some time in one of the houses in the extensive grounds of Ballynahinch Castle Hotel in Connemara. It wasn’t necessarily part of the plan, but he found the setting conducive to work and he wrote a substantial number of poems. Fallon is also a publisher – Gallery Press – and that might have been that, with his Connemara poems appearing as part of his next book, but he felt that what he had written was so connected to the place that he came up with a novel suggestion for Ballynahinch’s managerial team, Patrick O’Flaherty and Des Lally, who he knew to be informed about and sympathetic to the arts in general. Maybe, he said to them, they would like to publish the poems. To their great credit, they made the leap from hoteliers to publishers without missing a beat. Well, they did once they’d talked to a couple of publishers they happened to know, David Lilburn and Jim Savage of Occasional Press. The title is accurate as, since both Lilburn and Savage are artists, they are occasional publishers. The result was the first Ballynahinch-Occasional Press collaboration, Ballynahinch Postcards: new poems by Peter Fallon. The friendship blossomed and the partners went on to generate a number of titles, mostly built on working residencies at Ballynahinch involving poetry and the visual arts. 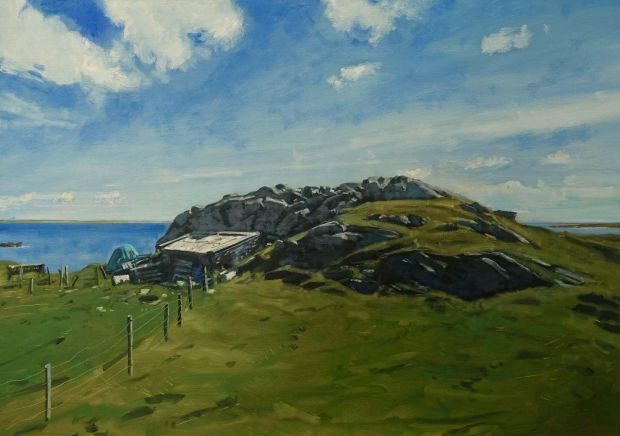 As part of this year’s Clifden Arts Festival an exhibition, Léargas – Connemara Observed, marked 13 years of collaboration, gathering work by six artists who have been involved along the way. That includes Savage, who has made a great deal of work centred on the epic west Connemara landscapes, a sweeping terrain of mountain, bogland, rock, pools, lakes, sea and sky. He is most usually associated with large-scale pencil drawings of figures and, more recently, landscapes. He has gradually incorporated colour, pastel and watercolour, though the spine of his work is still drawing. One of his pastels on view, the quietly monumental The Bog and the Mountains, is a superb piece of work by any standard. In it, our view extends from the rough foreground jumble of rock, vegetation and peat to the distant, misty ridge of mountains. He doesn’t pictorialise or romanticise at all, just provides an even, careful account of what is there, which makes it all the more powerful. Lilburn’s work has often taken the form of map-like drawings, dispatches from the front line of his life. In 2009 he produced Walking Drawing Making Memory: A Ballynahinch Sketchbook, and the show included a Walking Drawing, a composite of sketchbook pages that forms both a sequential record of a walk “from Mick’s cottage to Trá Mhór” in Murvey, Connemara, and cumulative overview of the walk. His way of working always creates a way in, a conceptual space for us, the viewers. In 2013, with poet Tony Curtis, he made a thematic book on the Connemara pony, titled simply Pony. As it happened, the nervous immediacy of Lilburn’s technique is perfectly suited to the subject, which comes across in his charcoal drawings and monoprints. Donald Teskey was more associated with the north Mayo coast, and perhaps the southwest, but he embraced the opportunity to explore a new terrain – as he generally does. 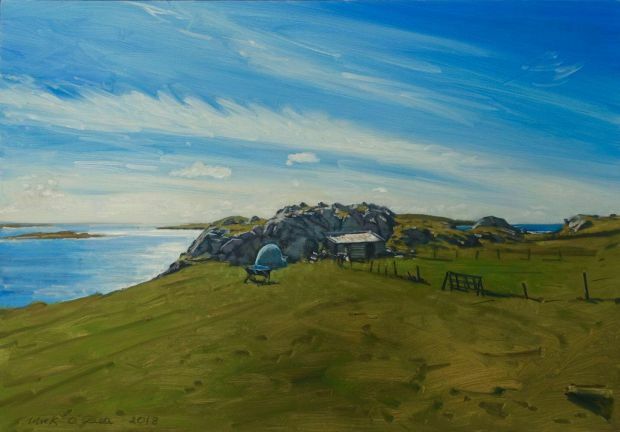 He made a great deal of highly energised work around Roundstone bog, Dog’s Bay, the Inagh Valley and other locations, for his Connemara Folio in 2011. Initially, he had made a print the previous year as part of a limited edition of Afterglow, an anthology edited by Peter Fallon and Des Lally (they put together work by Gallery Press poets that relates to Connemara). Mick O’Dea already had a strong association with the region when he embarked on making work for In Connemara, published in 2017. Again, he produced carefully observed studies of the landscape as it is rather than as it is often imagined. Joe Wilson’s Into the Mountains, in 2014, does exactly as its title says. A keen hill walker, in his carborundum prints and oil paintings, Wilson conveys an incredibly direct engagement with the highlands, usually seen from below, in passing. Up there, you’re in a vertiginous domain of clouds, mist and air. It is undeniably indicative of a gender imbalance that Dorothy Cross is the sole woman in the show. She lives in Connemara and it is noteworthy that the book she set about making (a work of art in itself) is a two-volume, reflective, fragmentary memoir, Montenotte & Fountainstown. She looked back from Connemara to her Cork roots. In collating and shaping a huge quantity of diverse visual material, she worked closely with locally based designers, Artisan House in Letterfrack, to make something exceptional. Léargas provided a welcome overview of an episodic project that has extended over a considerable period of time and, one hopes, will continue. None of the artists and writers involved has approached it in a facile or formulaic way. On the contrary, it’s been a spur to work very hard and test limits. The exhibition has finished, but information on the books is available at the website and email mentioned below.